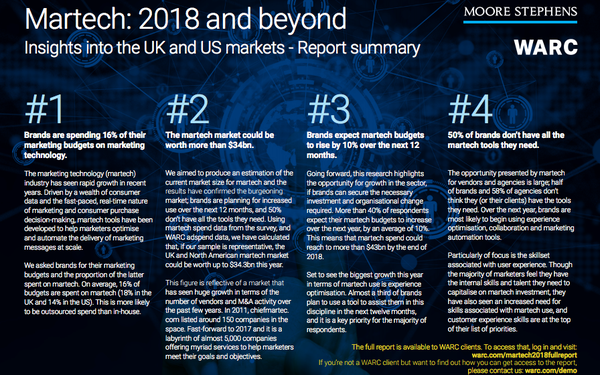 Marketers are currently spending an average of 16% of their marketing budgets on technology, according to an analysis of the so-called “martech” market released this morning by London-based WARC. That percentage, which has presumably grown in recent years as a result of an increasing reliance on data-based and programmatic technology, coincidentally is close to the historical norm -- 15% -- that marketers have paid ad agencies for buying media. “Marketers are most likely to be using a mar-tech tool for email, with 85% currently doing so,” WARC notes, adding that the majority also reported utilizing marketing technology for social media and managing CRM (customer relationship management) programs. So-called “experience optimization” and “collaboration tools” technology were cited by 37% of respondents, WARC noted, adding that they are both set for “a significant rise,” as an “additional quarter” of respondents said they plan to invest in such technologies in the next year. Interestingly, half the respondents said they are dissatisfied and don’t currently have the technology tools they need to do their jobs. “When analyzing by agency vs brand, six in ten (58%) agencies stated they don't believe their clients have what they need and don't fully utilize the mar-tech tools they do have,” the WARC report reveals. 1 comment about "Martech Now A $34B Industry, Represents 16% Of Marketing Budgets". Henry Blaufox from Dragon360, September 12, 2017 at 10:40 a.m.
Is the perecntage of spend overall a piece of a bigger total "pie", or is across the board spending flat (or even declining,) so that the technology budget supplants something else? This will vary by company, of course. But it would illustrate to some degree whether companies expect the spending to increase revenue, thus justifying incremental budget increases.